The Israel Movement for Reform and Progressive Judaism, women's organizations and various pluralistic movements have filed a petition with the High Court of Justice on against the prime minister and the Western Wall Heritage Foundation. The groups are demanding that seculars, Reform Jews and women be given equal representation in the management of the Western Wall, and are asking the court to remove the control of the holy site from the hands of the Western Wall rabbi. The petitioners include the Israel Movement for Reform and Progressive Judaism, Israel Hofshit ("Be Free Israel"), Kolech, the Center for Women's Justice, the Yaakov Herzog Center, Hiddush – for Religious Freedom and Equality, and the Women of the Wall. The Reform Movement explained that the petition was filed "following the stricter separation and modestly demands at the Western Wall, which have turned the entire plaza into a haredi prayer site." The movement added that "unlike in the past, men and women can no longer hold joint activities or hold a non-religious ceremony at the Western Wall plaza." According to the petitioners, the reason for the current situation is that "the Western Wall Heritage Fund, which runs the site, is controlled by haredi representatives… who are affiliated with an ultra-Orthodox stream which does not reflect the majority of Jews in Israel and abroad, who share a deep affinity to the Western Wall." The petitioners are seeking the disbandment of the Western Wall Heritage Foundation, which is defined as a governmental association, and the establishment of a different body which would be put in charge of the Western Wall while granting equal representation to women and the different streams of Judaism. They are also demanding that the control of the holy site be removed from the hands of the rabbi of the Western Wall and the holy sites, a position currently held by Rabbi Shmuel Rabinowitz. "In recent years we are witnessing a trend of growing radicalization in the Western Wall," the petition states. "Large areas of the plaza, which were open to both men and women in the past, have been separated. "Modesty usherettes have been stationed on the site, forcing women to cover themselves with scarves, even when their clothing is not revealing in any way. The Western Wall and its entire plaza has turned into a prayer site of a haredi nature, and non-religious events are hardly ever held there." 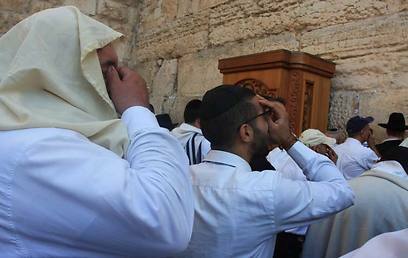 The petitioners claim that the said radicalization stems from the site's management by the Western Wall Heritage Foundation, which is mostly comprised of Orthodox representatives – religious and haredi. As a result, they say, the Foundation has adapted itself to the extreme haredi perception and "does not reflect the needs of the entire Jewish public in Israel," which is also comprised of a non-religious public. The appeal was made after community leaders and organization heads strongly protested the arrest of several Women of the Wall members who had attempted to pray at the women's section wearing a prayer shawl. The organizations' heads argued that the current policy excluded them from one of the most sacred places to the Jewish people, and was essentially treating the majority of the Jewish people as "second class Jews." They warned the prime minister and Jewish Agency chairman that the situation could affect the support given to Israel by Diaspora Jews. The mission of mediating between the parties was given to Sharansky, who is in close contact with leaders of the world's Jewish communities (especially the Reform and Conservative ones), as well as with the haredi public in Israel and the government. The Jewish Agency chairman is pursuing an agreement which would be based on upgrading the Robinson's Arch site, where – according to a High Court ruling – women are allowed to pray as they wish, and lifting some of the restrictions imposed on women at the Western Wall plaza. See all talkbacks "War on Western Wall reaches court "